NEW YORK, NY (March 10, 2004) - Manhattan Rickshaw Company, a pedicab company based in New York City, will be featured in the upcoming Thursday, March 11, 2004, episode of The Apprentice. The program airs on Thursdays at 9 p.m. EST. Further demonstrating the value of teamwork, Manhattan Rickshaw Company and Main Street Pedicabs, Broomfield, Colo., the leading U.S. Pedicab manufacturer, have "teamed up" on their own over the last few years. As a result, they've developed an industry-leading pedicab (think bicycle cab) service for New York City. In Episode 10 - "Wheeling and Dealing" - the remaining members of "Versacorp" and "Protégé" teams compete against each other by operating a pedicab (rickshaw) service. The 15-part show features the very-visible billionaire businessman Donald Trump, along with his two teams of young business men and women, in the quest to identify the best among them, who will become Trump's next employee and capture the title of The Apprentice. So, what's the story behind Manhattan Rickshaw appearing as the central theme on The Apprentice? Owner and manager Peter Meitzler explains: "The producers of the show approached Manhattan Rickshaw with the idea that each team of contestants would be in charge of a fleet of pedicabs. Then, we trained the members of each team how to safely operate pedicabs on city streets." "I was impressed with several of the business concepts the teams studied and executed. Fans of The Apprentice are going to love this episode because the contestants discovered that pedaling the pedicab business is truly about 'street smarts'," he says. The competing teams expanded on Manhattan Rickshaw's existing business methods or created new ways to market the company's services. On Thursday evening, March 11, viewers will see the business tactics each team decided to undertake. On NBC, The Apprentice appears at 9 p.m. EST and PST and 8 p.m. CST and MST on Thursday nights. Rebroadcasts of the popular weekly show appear on Wednesdays, following the original Thursday airing of each segment, at 8 p.m. EST and PST and 7 p.m. CST and MST. Often during rush hour, when available yellow cabs are scarce, practical-minded office dwellers hop into the pedal-powered cabs to complete their trips across town. As the evening progresses, Manhattan Rickshaw's fleet of pedicabs frequents the streets of Greenwich Village and SoHo. As the hour approaches curtain time on Broadway, Manhattan Rickshaws serve the theatre-going crowds before and after the shows. Late into the evening, New Yorkers and the city's guests can catch a pedicab in Times Square, the Flatiron District, or the Village to complete their evening. Manhattan Rickshaw was one of the first customers for Main Street Pedicabs, a Denver Metro-area company. In 1992, entrepreneur Steve Meyer acted as his own apprentice when he founded Main Street Pedicabs. Sensing that cities need to be less dependent on auto power, Meyer set out to improve upon the existing pedicab designs. The result was a 21-speed, tricycle rickshaw with hydraulic brakes and a differential for easy maneuvering in urban traffic. One design challenge was making sure the pedicabs looked attractive and had plenty of space for advertising - a major source of revenue. "The pedicabs are actually billboards disguised as a mode of transportation," Meyer says. Meyer's pedicabs have handled display-advertising contracts for well-known national brands, including Altoids, Budweiser, Coca-Cola, Kate Spade, MSN and Yahoo. "The ad executives know that pedicabs offer - literally - an ideal advertising vehicle to reach the urban, urbane and upscale market," Meyer says. Main Street's cabs have been sold throughout N. America and Europe. 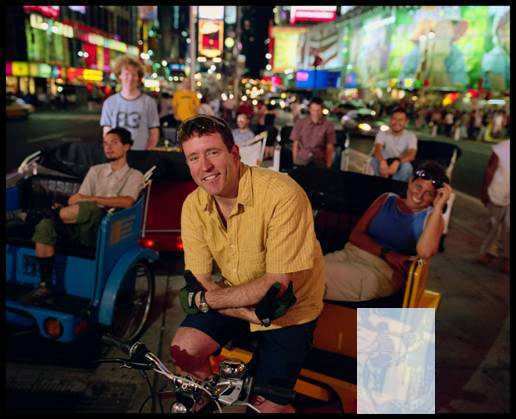 Manhattan Rickshaw Company was formed in 1995 by Peter Meitzler and was the first to use Main Street Pedicab's 21-speed, high-tech pedicabs in the City. Meitzler, a cycling activist in such cities as NYC, Los Angeles and San Francisco, brought his energy and advocacy experience to pedicabs. Over the years, with the partnership of Main Street Pedicab's president Steve Meyer, Manhattan Rickshaw has grown to be an industry leader. To learn more about Manhattan Rickshaw, go to www.manhattanrickshaw.com. Main Street Pedicabs is the largest manufacturer of pedicabs in North America. Main Street Pedicabs are mountain-bike-style, tricycles sporting fiberglass cabs with cushioned seats and waterproof canopies. The pedicabs are designed to not only provide a fun comfortable ride, but also, to make a great presentation for sponsors' advertising. For more information, visit www.pedicab.com. 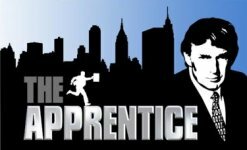 The Apprentice is a 15-episode unscripted drama in which candidates from all walks of life, including both Ivy League MBA graduates and street entrepreneurs with no college educations, endure rigorous business tasks each week while living together in a hip Manhattan loft apartment. Each candidate is forced to think outside the box in order to outshine each other to get to the top, yet the candidates must work in teams to win each week's challenge. At the conclusion of each business assignment, the winning team is granted a lavish reward, but the losing team must report immediately to Trump's boardroom where one of the losing-team members hears, "You're fired!" Trump will grant the winner of the competition - the true "apprentice"- a dream job with The Trump Organization at an annual salary of $250,000! For more information, go to http://www.nbc.com/nbc/The_Apprentice. We were on Week 10.